The Wreath Rings are available!! I do not have the proper lighting or a camera that takes quality close up pictures - they look better in real life! *Sizes larger than a 12 will be additional. 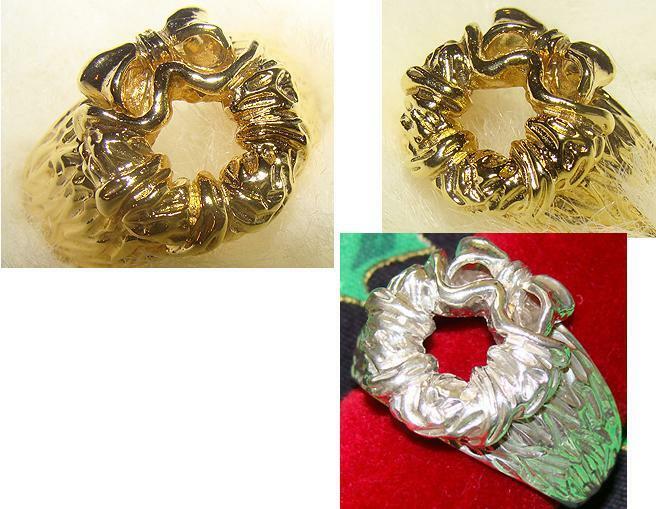 For every whole size jump in the size of the ring (just the silver w/gold plating) to add $15. So a size 14 for example, would be 2 whole sizes larger so you would need to add $30. Please PM me for current quote for 10kt or 14kt. Turn around time is about 10-14 days, maybe less + shipping time. As Silver and Gold prices go up, the prices of the rings will increase as well. Because of the daily fluctuations in both the gold and silver market, I am going to be stating that ALL the rings prices are subject to change, and to call for the current price - I can't keep changing it every other day. Email me directly if you are interested.